Structural Integrity – "Every literary product is an impure product." With its lack of iconic buildings, it can be said that the charm of our fair metropolis is best experienced at street level—street level being the amount of time spent stuck in traffic on Edsa (or Buendia, or Taft). The built environment, at best, provides us with a minor consolation from the tedium of everyday life. Buildings serve as landmarks; looming on the horizon, they can signal either a turning point in a long and winding journey or a cue that you have arrived. 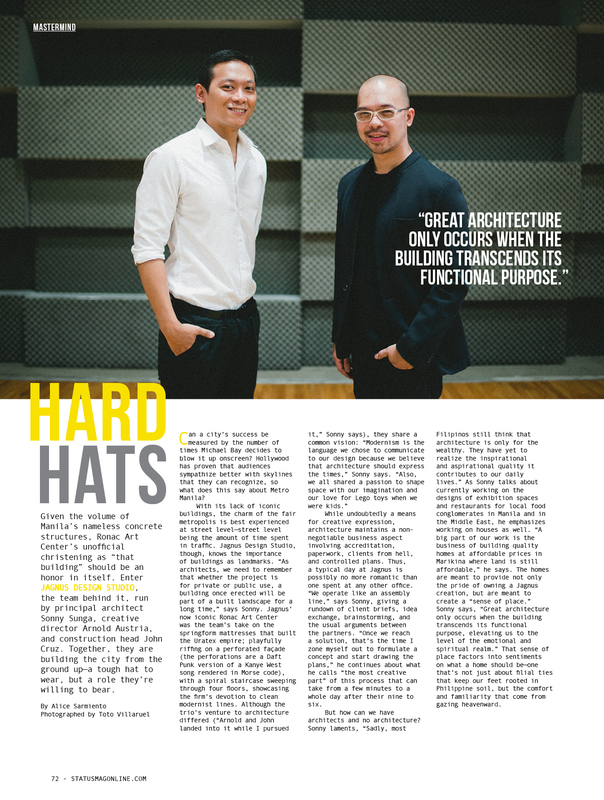 “As architects, we need to remember that whether the project is for private or public use, a building once erected will be part of built landscape for a long time,” says Sonny Sunga of Jagnus Design Studio, of which he serves as the Principal Architect, alongside fellow architect Arnold Austria acting as Creative Director, and John Cruz heading construction. Jagnus’s now iconic Ronac Art Center was the team’s take on the springform mattresses that built the Uratex empire; playfully riffing on a perforated façade (the perforations are actually a Daft Punk version of a Kanye West song, rendered in Morse Code), with a spiral staircase sweeping through all four of the building’s floors, showcasing the firm’s devotion to clean modernist lines. While undoubtedly a means for creative expression, architecture still has that non-negotiable business aspect: with one foot deeply immersed in a world of accreditation, paperwork, clients from hell, and controlled plans. Thus, a typical day at the Jagnus Design Studio is possibly no more romantic than the days spent at any other office. “We operate like an assembly line,” says Sunga, giving a rundown of client briefs, exchanging of ideas, brainstorming, and the usual arguments between the partners. “Once we reach a solution, that’s the time I zone myself out to formulate a concept and start drawing the plans” he continues, of what he calls “the most creative part” of this process that can take anywhere between a few minutes to day after 9 to 5 day (or in the case of Jagnus staff, 9 to 6). That this can be the world behind Metro Manila’s chaotic built environment remains a mystery, and begs the question: How can we have architects and no architecture? To which, Sunga laments, “Sadly most Filipinos still think that architecture is only for the wealthy. They have yet to realize the inspirational and aspirational quality it contributes to our daily lives.” He continues, “A big part of our work is the business of building quality homes at affordable prices in Marikina where land is still affordable.” The homes are meant to provide not only the pride of owning a Jagnus creation, but are meant to create a “sense of place”. Pingback: myDorm, Inc. Commissions Jagnus Design Studio for One Espana Boutique Dormitory Project | MyDorm, Inc. I read this article in print while awaiting my fate outside the admin office of this small school I was a part of for a brief time. It made the wait more bearable. That’s cool! I’ve never even held a hard, laid-out copy of anything I’ve written for…most magazines. See, mom? People actually read my work. Why not? Is it odd that they don’t send out copies to their writers? Or will they go broke if they do that? Haha! I’m actually planning to set aside an hour or so a day to go through everything here. Would you mind if I printed out some articles for offline reference? That’s very kind of you to say. And feel free to print out whatever you like, after all it’s your ink! Previous Previous post: Luna Blanca: Or, Are We Being Trolled by GMA?